If you're in our hemisphere why not come and join us for a right ol' knees up as we celebrate another year of bringing poetry to the masses. It's our very own brand of gross consumerism which is, after all, what Christmas is all about. If you're able to come you'll have the once-in-a-lifetime opportunity to purchase back issues of Catalyst, the coolest, most innovative and exciting literary journal in NZ at never-to-be-repeated prices. 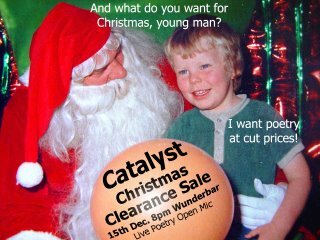 Poetry is hotter than ever - but stocks won't last! If you are one of the accursedly unlucky who do not live in Christchurch or indeed New Zealand you can make yourself feel better with some long distance poetry therapy - namely SUBSCRIPTION! Yes! We deliver! And it's cheaper than normal too - plus your currency is probably stronger than the kiwi so you'll make on the deal! Wow! We live in a beautiful world. Details are in our profile in the sidebar. Share poetry with a loved one this Christmas. Stuff the kids stockings with something other than playstation or toys - yes you can change the world!